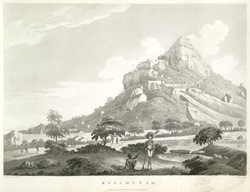 This uncoloured aquatint is taken from plate 5 of Captain Alexander Allan's 'Views in the Mysore Country'. Rayakottai is in Dharmapuri district of Tamil Nadu. During the third Anglo-Mysore war in 1791, the fort there surrendered to Major Gowdie's detachment. Allan wrote: "13 guns, and a proportionate quantity of military stores were found in the place, which was occupied by a respectable garrison and remains the only fort above the Carnatic Ghauts secured to the English by the treaty of Seringapatam." At the end of the war in 1792, Tipu Sultan of Mysore had been defeated at his capital Srirangapatna and forced to sign a peace treaty, ceding half his dominions and a large amount of money to the British under the Governor General, Lord Cornwallis. This fort was one of a significant number retained by the British under the treaty's terms.